This number should not to be used to report emergencies and is not staffed 24/7. Fire protection to the city of Maize is provided by Sedgwick County Fire District 1 and is served by Sedgwick County Fire Station 33 located at 10625 W 53rd St. North in Maize. Station 33 is staff 24 hours a day, 365 days a year by trained full time, certified fire fighters and EMT's. 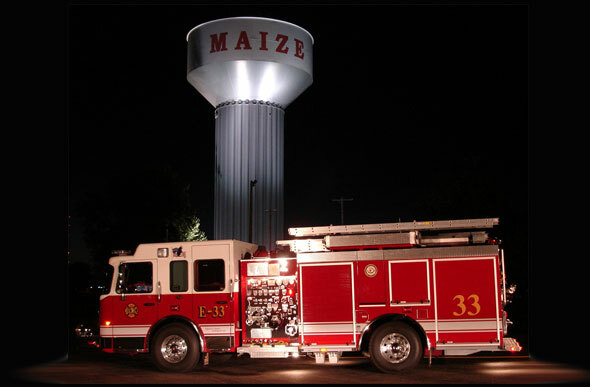 The City of Maize has a Class 2 rating from ISO's Public Protection Classification. Sedgwick County EMS provides 24 hour emergency medical care to all areas of Sedgwick County including the city of Maize. Ambulances are staffed by Kansas certified Paramedics providing the highest level of pre-hospital emergency care to their patients. EMS Post 14 is located at 4030 Reed Avenue in Maize next to the City Hall Complex.